On a sunny but cold November morning I went out with 6 volunteers from Bowdon Parish Church. Bowdon are one of our DofE centres who do all the training of groups themselves then ask us in to manage their expeditions. They have a number of qualified staff so they provide some volunteer supervisors on these expeditions too, which helps them keep the costs down. In fact, as some of them now occasionally freelance for us on other groups expeditions they now make up the majority of the staff on their own expeditions with us only supplying a course director for each cohort of groups. Anyway, they asked me to run a 'How to teach navigation' course so that they would have a more standardised approach to their teaching. 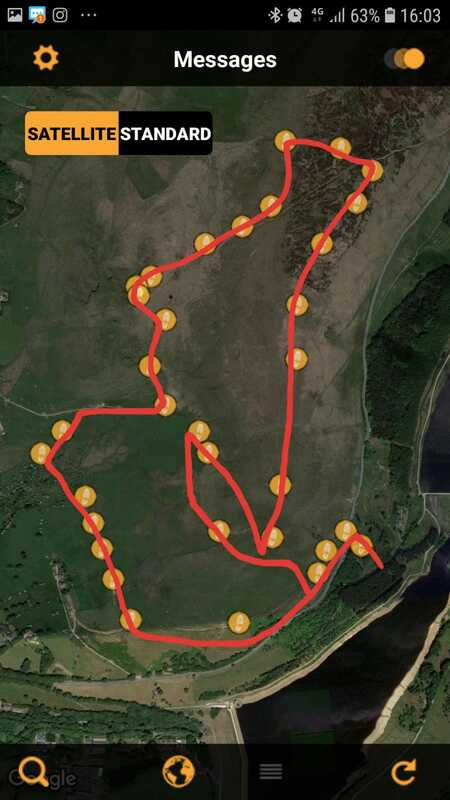 For the first 3 hours of the day we mooched about on the edge of the access land under Saddleworth moor and by lunch time had only walked 1.5 km!! We then looked at 2 trackers (Spot and Beyond Marathon) in detail looking at the pros and cons to both) (more info on trackers can be found here). We also looked at two ways of getting a group to send their location to you using a smart phone. We discussed OS Locate but demonstrated 'Whatsapp' and the new but beautifully simple SARLOC for DofE. After lunch we headed up in to the wind on the top of the moor to cover the more advanced aspects of navigation before dropping back down to the car park. For four days last week I was working in the Peak District for Lupine Adventure for whom I am a freelance leader/instructor. The job was to work with a group of young indoor climbers from Crawley & Brighton as they sample outdoor rock climbing. Monday – I chose to take the group to Birchen Edge as I regard it as a ‘friendly’ crag with a wide range of routes at across grades whilst the height of the routes isn’t overly intimidating, it is also a good crag to rig for top ropes. With most of the group being repeat clients from their trip last year we ran through the safety information, kit and crag etiquette before getting to the important subject climbing! The day gave me the chance to check and assess belay technique, standard and ability of climbing and then make plans for the remaining days. 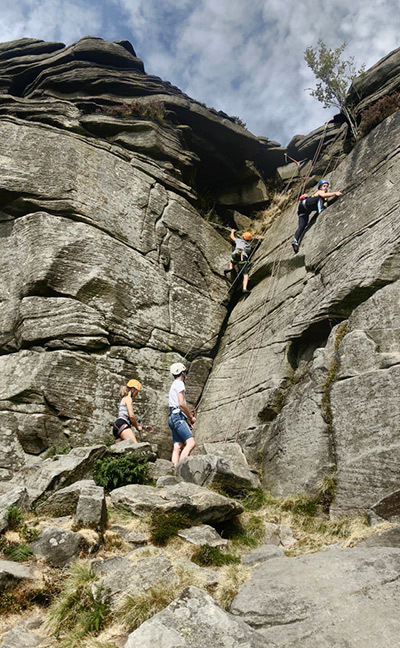 Climbs included – Sail Buttress HS, Right Ladder Chimney HVD, Captains Bunk HS, Captains Prerogative HS, Blind Eye S.
Tuesday – After seeing the group climb at Birchen Edge I decided to take them to Stanage High Neb. A higher crag with much more exposure but I was sure the group could handle it and would enjoy it. During the day I also set up a ‘Top Out’ route which allowed some of the group to climb the route completely then walk back down to the bottom of the crag instead of being lowered back down the route. 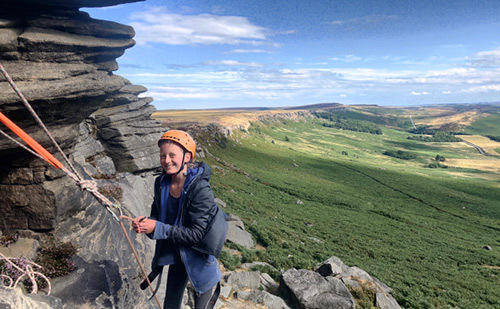 Young Jess at 9yrs old managed to climb a Stanage E1!Climbs included – Limbo S, Following On VS, Boyds Crack VD, Cent E1, Neb Corner VD. Wednesday – with a couple of the group keen to push themselves on rock I again took them to High Neb where I rigged a couple of slabby routes, and also an E2 route which involved climbing a roof for those feeling strong. Unfortunately the weather decided to deliver some wind and rain later in the day but not before some exceptional effort had seen a number of the group reach the top of the E2! Climbs included – Eric’s Eliminate S, Straight Crack HS, Sogines HVS, Kelly’s Variation S, Quietus E2. Thursday – with the forecast predicting showers during the day we made an early start and headed for Lawrencefield Quarry where we could seek some shelter if the showers arrived. As the day went it was fine and we stayed at the quarry in good conditions with plenty of climbing done to make up for the slightly early finish the day previous. The day saw everyone making the most of their time and committed to their climbing. Climbs included – Bole Hill VD, Limpopo Groove VS, Morning Glory E2, Tyrone VS, Nova HS, Chilly Days and Purple Acorns E1. Overall – I have to admit that at the end of the four days I was physically and mentally tired, but that was outweighed by the enjoyment of it also being extremely rewarding due to the commitment shown by the group. Their behaviour and crag etiquette are exemplary and the job probably wouldn’t work if it wasn’t. It’s scary how good and how strong some of these climbers are for their age, moving up technical and difficult routes like rock spiders! 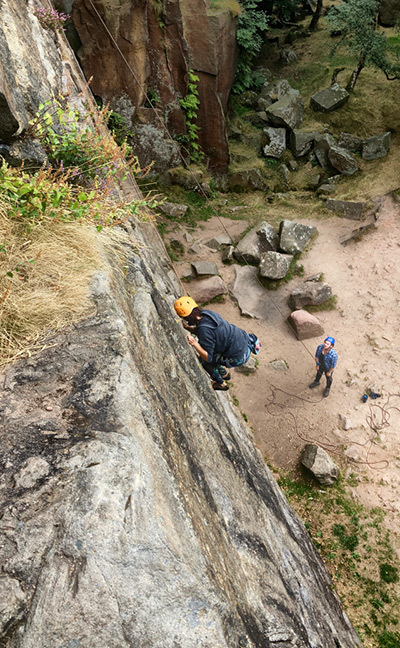 N.B Single Pitch climbing is described as climbs that – are described as single pitch in the guide books, climbers can be lowered back to the ground from, is at a non tidal/ non serious/ presents little objective danger, presents no difficulties on approach or retreat, is climbed without an intermediate stance. Charlie is a freelance Mountain Leader, Rock Climbing instructor and International Mountain Leader. The voice at the end of the phone, Ben Barnard at Lupine Adventure Co-operative, boomed on speakerphone as I sat in a car en-route to Yorkshire Dales for a separate Lupine job. For every outdoor instructor, the car becomes essentially the unofficial office space in the summer months. I flicked through my diary and saw for the next week or so a chaotic scribble next to each day denoting various outdoor jobs around the country. Accepting the job meant travelling across the country before heading towards North Wales and immediately finishing for another job in the Yorkshire Dales, some two hundred miles the following day. ‘ Go on then, sure thing,’ I said. Five days later after my phone call with Ben, I’m standing by Electric Mountain just off Llanberis high street, anxiously waiting alongside Sam and Tamsin waiting to meet a coachload of keen and excited students from Rochdale Islamic School. 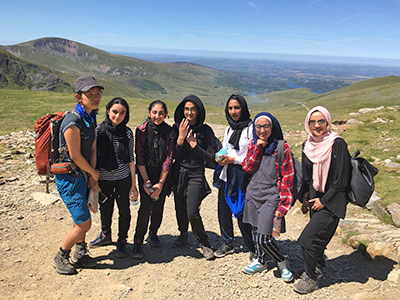 Twenty-five female students, aged between 12 and 16 step out from the coach, their jaws dropping as they gaze with fathom at the summit of Snowdon, a vertical km above their heads. After initial introductions, briefing the groups about the risk of the hot weather, drinking enough water throughout the day and reminders to stay together, we set off in pursuit of the mountain summit against a cloudless blue sky. It’s hard to know initially what to expect with groups with regards to their previous experience, ability and motivation. Yet what we were greeted with was an incredibly supportive group of young people ready to embrace the challenge. 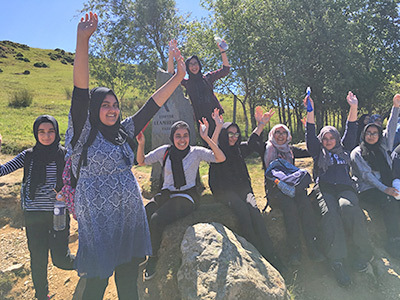 A group of young women, from an all-girls faith school in Rochdale, who in their own words told me ‘We’re not as Muslim as people like to think.’ With their walking shoes laced up, backpacks with water filled up and hijabs adjusted, the pupils made their way up the steep ascent out of Llanberis. The sense of unity and support for each other was evident. The girls told me how their year groups are the same size as some class groups in a standard school. The groups naturally bonded together, chatting & talking constantly on the way up. They told me how they had excitedly talked about climbing Snowdon during lessons with their teachers. 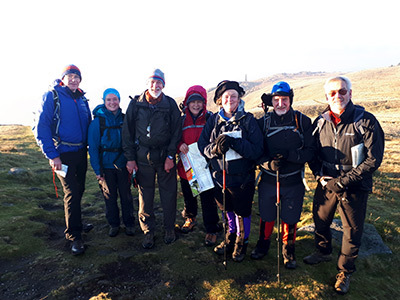 What made the instructing experience special was that for many of the participants, they have never been to Snowdonia, or even explored the outdoors outside of Rochdale. As a female instructor, from an ethnic minority background leading my group, many of the girls were curious and inspired for my reasons of instructing groups in the mountains. One of them even asked how many times I climbed Snowdon, as if climbing the mountain on repeat occasions was an indication of how much I loved the area. The inspiration to the participants was a key reminder that we need more instructors from all backgrounds, to remind the next generation of what they can achieve if they put their minds to it. Overall , the day saw two groups reach the summit of Snowdon (1,085m), a group reach Clogwyn Station ( 779m) and a group reach Halfway House station. Yet the day was a reminder of the reasons why I choose to work for Lupine Adventure Cooperative as an instructor. Working in the outdoors has taught me a lot about my approach to adventure, and how we can all do our bit to inspire and teach others to climb their own mountains. Sometimes opportunities like these are worth the journey, presenting themselves when we least expect them. I loved my experience working alongside young people with some unexpectedly brilliant experiences. Freelance Outdoor Instructor and Adventure Photographer based in Sheffield. If you would like Lupine Adventure Co-op to help your group rise to the challenge of Snowdon then take a look at our snowdon pages. 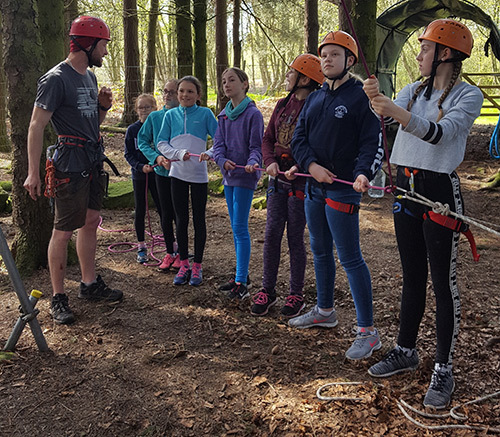 Today I have been working for the Lupine Adventure Co-operative providing a thrilling and challenging crate stacking activity for the Girl Guides at the Harrogate and Nidderdale Scout (HANDS) camp. Upon arrival at the Thornthwaite Scout camp I was blown away by the remote feeling that this place has, the rolling hills and luscious green backdrop dotted with farms and woodlands. I was welcomed in by the troop and offered coffee within seconds of being through the door, a fantastic start. Once refreshments and greetings were done we took the short walk to the activity area, this took us through some of the available camping pitches which are well spaced between native trees and separated by huge grit stone boulders, a beautiful spot. Rachael, my girl guide leader for the day, headed off to collect the first of 3 teams of girls to take the crate stacking challenge. They arrived with a fine balance of excitement, nerves and all the curiosity you expect from a group of young girls who are about to climb up a pile of milk crates to way above their own head height. After a safety briefing and some hints towards success the game ensued. 1 on the crates, 2 passing them more crates and the rest manning the ropes to ensure their safety. 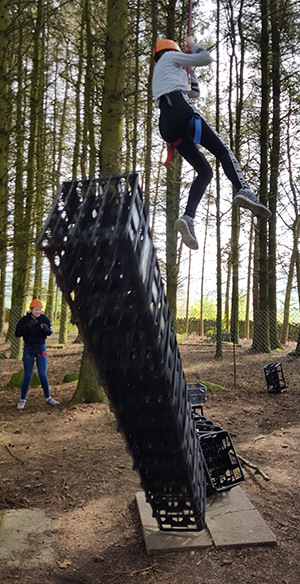 The group quickly learned from their experiences and before the whole team went through they were already reaching double figures for the number of vertical crates. With only 5 minutes to get as high as possible, there isn't much room for error. With the whole of our first team through the record was set at 14 crates high, about 12ft high!!! Our next group approached as the others left, a very quick turn around. The previous record had obviously been passed on as the 2 groups passed each another, amazing how much info can be exchanged between girls in the matter of a few metres. The one bit of info not shared was the recipe for success.. Those nuggets are far too valuable. Prior to coming to the activity the second group had been cooking on an open fire with their other instructor, so the lot of them were full of sugar from many marshmallows and other sweet goodies from the campfire. This made for a very active group who were raring to go. This group had their own tactics to reach the top of the crates league, 1 person stacking the other supporting the ever growing and wobbling towers. This technique paid off with a record number of 15 crates being reached. Some spectacular balance and players pulling wobbling towers back in with the tips of their toes. We then headed for lunch which was served by the troop in a very courteous and polite manner. Even once finished I was told by the girls to just leave the plates they'd sort it. This is something I've seen from both Girl Guides and the Scouts, a fantastic organisation that teaches young people to look after them selves and others. A credit to the leaders for being influential role models for these children. The 3rd and final group of the day had spent the morning doing archery and a bit more camp cooking, they were full of beans and the cheese and tuna and marshmallow and.... You get my drift.. You'd expect that to mean less energy but no.. Thankfully still right on it. This group adopted a few different strategies, namely the dance side to side between crates technique which seemed a little contrived in the search for success, the other was for the person who was on the crates to always have crates in their hands to reduce the need to pass more up once they were higher up. This seemed to knock them off balance whilst already fighting to stay upright on a very rock n roll pile of crates. In the end this group did not break any records but they had a good time trying. 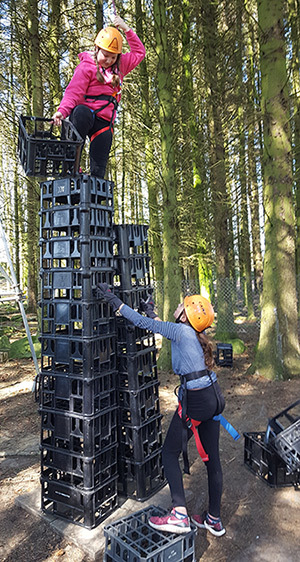 Upon reviewing the activity the girls all saw a marked improvement between their 1st person up the stack to the last, they put this down to learning from the experiences of others within the group. I couldn't have put it better myself. One question asked by all 3 groups... Who first decided that crate stacking was an activity?? To be fair it is a bit odd, piling plastic crates one on top of the other and seeing how far you can get.. Odd but definitely good fun. A massive thank you to the girls for a great day on the ropes, to Rachael for her continued assistance throughout the activity and to the rest of the team at Thornthwaite for the coffee and delicious cake. We've run our annual trip to Skye for 2010. We've uploaded some photos onto our facebook page. You don't need an account to view them just click the link and click on a photo to enlarge it. We're busy writing a full report of the trip which will appear soon. So you have decided that you want to be able to track your DofE groups to help with your supervision plan or to comply with your risk assessments (we have a blog post on that too). Which one do you go for? This is an attempt to break it down for you so that you know what are the available options. Types of tech, rent or buy? This article was written in February 2018. We will try and keep it up to date. The first big difference between trackers is how the location information is transmitted from the tracker device to the supervisor. Most use mobile phone sims with the obvious drawback that they will only transmit when in signal. There are a few that use satellites to transmit this information so we'll start with them. 3 custom message buttons and a SOS button direct to the emergency services. App for Android and Apple Phones. 5 minute interval tracking as standard (but can be set to 2.5 minutes for an extra £50 a year). Satellite communication so will work pretty much anywhere in the world (but can be a bit flaky around the poles and the African equator (best use a Iridium based system for those areas). Spot Coverage. No option to use OS maps. Location information send in latitude and longitude rather than OS grid references. There is often a lag in the server reporting so you may not get updates for between 10 and 45 minutes then get lots at once. 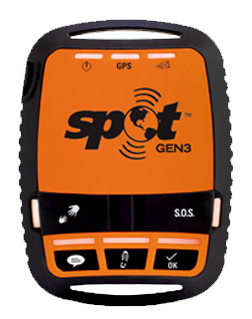 The Spot Gen 3 is a great bit of kit. 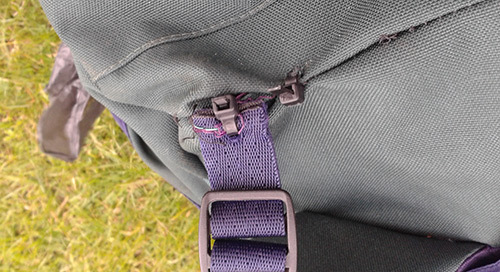 You switch it on, activate tracking, then stick it in the top pocket of a rucksack and forget about it (it does need to be right at the top of the bag, preferably facing the sky). If it isn't moving then it goes to sleep to save battery power. It comes with an app that shows the location using google maps. There is the option to switch between the very basic google map and the satellite photo which makes transferring working out where they are on your OS map pretty easy. You can't have an OS map overlay unfortunately and if a message button is pushed location data is sent in latitude and longitude so you need an app on your phone to convert to the national grid (or access to a website to do the conversion, unless you can do it manually). It has other less known features in that you can set it to send an alert when it moves if it hasn't moved for a number of hours. You could use this to give you a wake up call when their bag is moved for the first time in the morning :-). You can re-programme the buttons to send alerts to multiple email addresses and mobile phones. I think that you get 100 text messages a year included in the fee and if you do ending up using them all you simply buy another package of 100. If you want to buy a spot then the cheapest way is usually to buy the unit and then register it when it arrives. This will depend on how many of their services you want to subscribe to. If you go for the bare minimum then it will only cost a little more than the standard Spot fee. If you go for all the whistles and bells it could cost you a lot more. To use OS mapping there is an additional cost that is vastly different between school and commercial users. 3 message buttons and a SOS button direct to the emergency services. 5 minute interval tracking as standard. 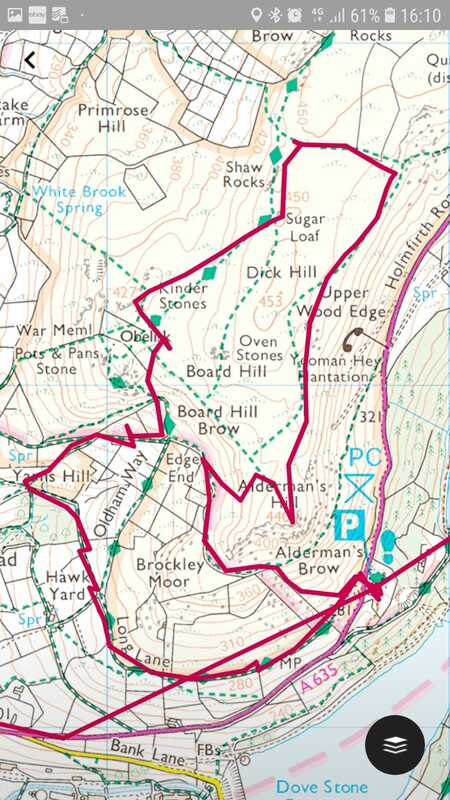 Option to have it integrate with OS maps. Locations can be given in OS Grid references. You can send an SMS text to the Mapxy server and it will reply with the last known location. 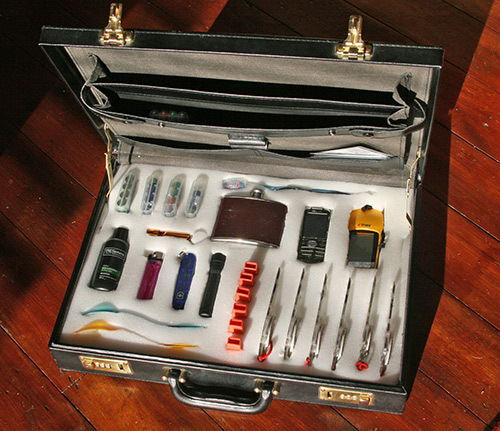 You don't have control over the device configuration, that is done by Mapyx. More expensive than the standard Spot system. Mapyx have developed a system that integrates with the Spot system. They register the unit for you and then route all the tracking information via their servers. 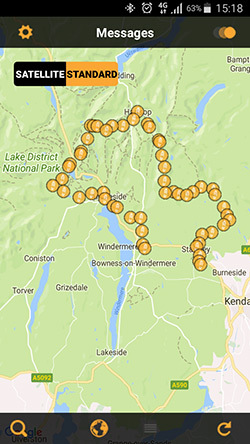 You then run their software on your laptops, tablets and phones, which you can use with OS maps for route planning as well as tracking (there are many different features that you can opt in or out of). It also means that they have been able to develop extra features such as the ability to text a request for the last known location of a unit. The downside is that they can't give you configuration access to the device as you would then have access to ALL their clients devices. This means that you need to set it up once and keep to that system (you probably need a dedicated mobile phone to receive messages). It may be that they will do a set number of re-programmes a year but I doubt they would be happy to do a re-programme every time you use them. If you want a bit more support then Mapyx could be your best bet, but you do pay for that. Mapyx will also hire out their Gen3 Trackers for £66 per week. There is a massive array of this type of tracker. They range from purpose built units designed specifically for outdoor pursuits to little units to stick in your car in case it is stolen or to attach to your pet in case they go AWOL. You can even just use a smart phone with an app that is designed to help you find it if you lose it running in the background. I will only detail a purpose built solution before listing some other bits of kit and apps that could be used for this purpose. Annual Fee £19-£96 (£8 per month when active but you can drop it down to £1 when you are not going to use it). 15 second update interval Though this would only last a day. 2 minute update interval should last a gold expedition. Built in rechargeable (usb cable) battery that should last a whole expedition. Relies on mobile phone signal. Beyond Marathon sell and hire out these trackers. They each have an “emergency SIM card” in, that works all the mobile networks in the world, combing the coverage of all the networks, not just one. They can be put inside a rucksack, they don’t need line of sight to satellites to transmit the location. They can be set to update as fast as every 15 seconds if desired, but generally it is best to set them at 60-120 second updates so you get 4-7 days of life, 10 days or longer from the bigger model (90g). Beyond Marathon hire these out for £15 per unit for silver and bronze expeditions and £30 per unit for a week long hire for gold expeditions. If you hire them then you get access to OS mapping as well for an extra £1.50. The above list are all that I have researched in detail so far. There are many more on the market and many that I was aware of seem to be out of use these days. There are other ways that you can track groups or at least find out their location by using text messages. The following methods are not really designed for the outdoor education purpose and are therefore not really recommended but they include. Squanto. GPS £40-£50 for unit. No monthly cost works on Giffgaff SIM. £10 credit lasts several expeditions. Lasts 36h tracking with app, 5 days on sleep mode and text to get location. Or mix of two. Works well and affordable, but relies on cellular. Android phones - Wheres My Droid. Buy a cheap android phone for £30 and install Wheres My Droid. Simply text it a code and it texts it's location back. (This is very cheap as it uses no data, the only cost is the price of the phone and a text message but has no 'tracking ability'. Android phones - Real-Time GPS tracker from Green Alp. This is free for up to 4 groups. It does require a data tarrif but doesn't cost that much and you can set 'geo fences' alerts if your tracker strays outside of a designated area. Apple Phones: 'Find My iPhone. Any smart phone: Google location sharing. This does use data but is more of a track than simply using 'Wheres My Droid'. If you see any inaccuracies in the above or use any of these devices (or anything else) and think people would benefit from your experience then get in touch and we can add to this page. Pipe cutters for aluminium tent poles. If you buy replacement tent poles then you generally buy by the width and have to trim them down to the right length. A couple of quid on one of these is a lot quicker, easier and neater than a Hacksaw, it is also easier to transport as has no blade to snag on things. You possibly know this but if you are conducting remote supervision in a hilly area then you really need a pair of Binoculars. It can take a lot of the guess work out of identifying your group from a distance. 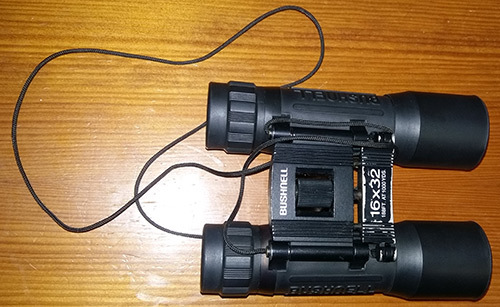 I bought a pair of Bushnells for about £20 and they seem pretty decent for a budget binocular. The 16x32 number means that things will appear 16 times bigger and the big end lens is 32mm across (the bigger the lens the more light and clearer the image). Feel free to put links to good specific binoculars you have discovered in the links below. Uni Posca paint pens are great for marking up tents, boots anything really. It is paint in a pen. We bought the PC-5m nib size in 'White' and 'Metallic Blue' which seems to work well with most things. 4. Dash for it maps. Dash for it maps are OS map wholesalers. Their maps are generally about 1/3 price than you would find on the high street. It is staggering how much cash we have saved since they were brought to our attention. At the join of aluminium tent poles there is a short smaller tube of aluminium that slots into the next pole (the silver bit in the photo below). Sometimes groups accidentally force the silver bit into pole 2 when trying to slot pole 1 over it. When this happens your first reaction may be to assume that it has snapped off in pole 1 but no it is just pushed in to pole 2. You can use a crochet hook to put it back out again then simply squeeze the end of the pole (where you can see the 2 dimples in pole 2) with pliers to make it stay in place again. We use a 3mm crochet hook but it looks like you can buy a whole set for the same price then you can choose the one that fits your poles best. We wanted some branded T-shirts but wanted them to be half decent wicking shirts. JC040 seems to be some sort of product number for these shirts and we think they are great. Some (cheap) wicking t-shirts smell really bad quickly but these don't. 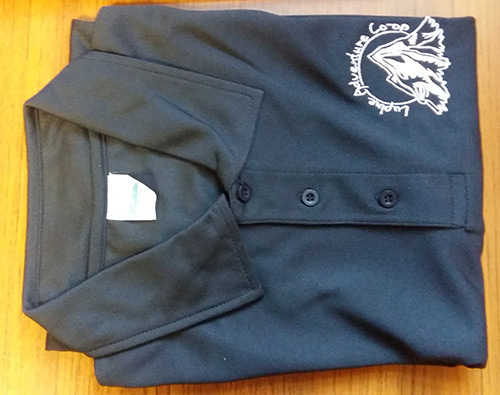 If you or your group want dirt cheap wicking polo shirts to get embroidered (or just to wear as they come) then ask your embroider for JC040 and they will probably be able to sort you out for under £8 each. 7. Tag your kit in stores. We bought a load of these red and green blank credit card sized tags. When something comes in it is checked, and if all is well a green tag is signed and dated and attached to the kit before the kit is put on the shelf. If there is a problem with it then it is red tagged and the problem is written on the tag with a sharpie. When the kit goes out the tag is removed and put in a tub by the door for cleaning before being returned to the box. If the links above have expired then searching for '100 green pvc cards' on ebay or amazon should bring them up. I usually carry two of these. One lives in my first aid kit should the worst happen and the other in a dry bag. The one in my dry bag gets used mainly for debriefs. When I debrief I usually conduct individual debriefs on the move in the last 2 or 3 km of the expedition. 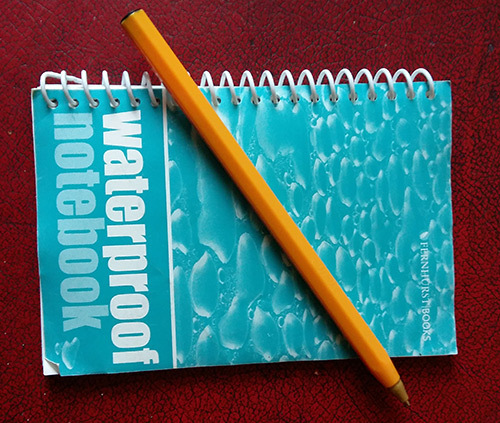 When doing this I make notes in my waterproof notepad that I can refer to in the group debrief near the end or in my assessor report (depending on my role and the expedition) I usually use my red Staedtler pen but a biro works just as well. There are a few brands available. The one shown below, Lomo, Rite in the rain. Cable ties are great for fixing boots, rucksacks, tents and more 'in the field'. I started carrying them as advised on Winter Mountian leader training as a crampon fixing tool but they have made the move over to my summer kit and get used more than you would imagine (though never for fixing crampons). I guess I don't really need to put this here but they are great. The red one cleans off (with meths) better than most colours, get the superfine point. There are lots of different ways to teach compass use and taking bearings, you often need to take different approaches for different students. 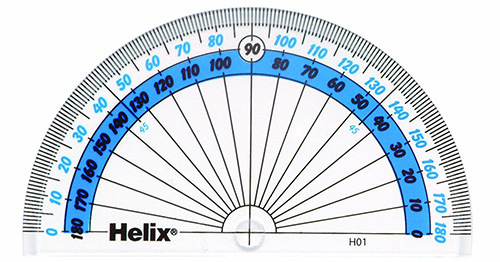 One day a student said something along the lines of 'so you are using the compass like a protractor'. Since then I have found that the following process works really well. 1) Asking students to guess the bearing first then turning the dial on that compass to that bearing. 2) Then saying that you can be more accurate by using a protractor to read the bearing and again manually turning the dial on the compass to that bearing. 3) Then saying you can be even more accurate using the compass as a protractor to read the bearing and demonstrating how to do that. This method is lost on older people as they probably haven't seen a protractor for 50 years. You need boxes to put things in. 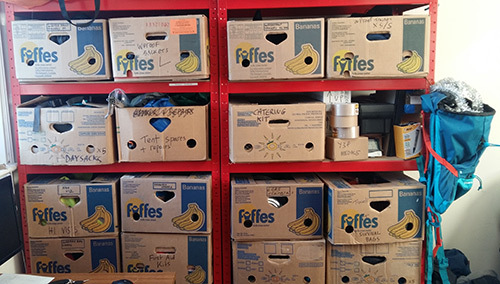 In our opinion banana boxes are ideal. They are a good size, big enough to get big things in but not so big that they become very heavy. They are breathable, if something is slightly damp it doesn't really matter. They are pretty robust and when one gets a bit battered you just replace it. 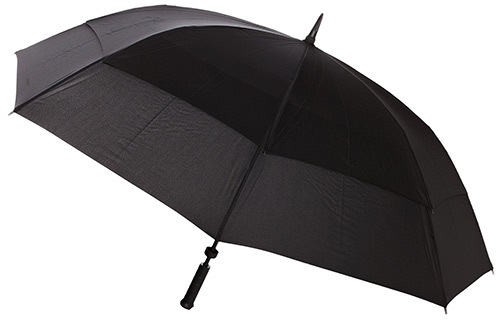 I know it isn't really the image for the outdoor professional but a decent umbrella is great for remote supervision. Most waterproof systems work best with a nice big heat gradient between you and the outside. Fine if you are walking, not so great if you are sat still. Life sat in the rain is so much better under an umbrella. This type has wind vents so you can use it in a wider range of weathers. 14. 12 litre really useful boxes. 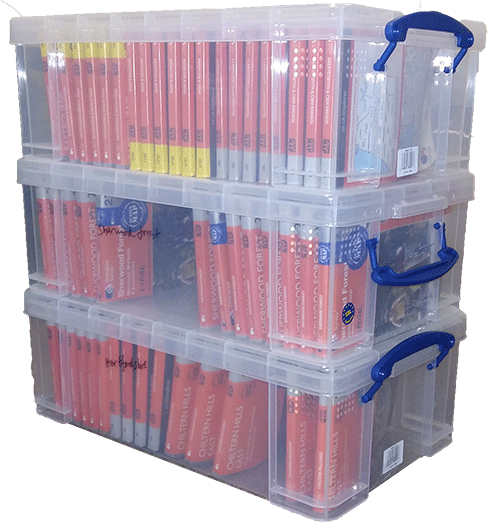 The 12 litre 'Really Useful' box is just the right size for storing and transporting maps.